What does it mean for a Church to be led in a way that is life-giving and invites the transformation of her members to be set aside for God’s holy use? There is much talk of restructuring in the Episcopal Church right now. There is lots of conversation about the nature of our structures, our need to be a missionary (or missional in more contemporary parlance) people, and our need to create a culture that responds to the society we actually find ourselves a part of. One of the challenges of administering Sacraments is that we are administering an objectively changed reality to people with varying degrees of perception as to their truth and efficacy. We rely on the wisdom of our people to allow the changes being wrought to take root in their heart and way of being in the world. Our challenge as a Church now, with regard to the shifting of society, is much the same. We are being called into a new time that requires the fullness of human creativity and participation to match the changing reality in which we find ourselves. The task is one of perception and discernment – to see God at work as much in the world around us and its manifold changes as we are aware of his action and Grace in the Sacraments. It is a difficult thing to see and lead Sacramentally for it means necessarily to lead and see by trust. We have only the Lord’s word that anything new is happening with bread and wine or by water. We also have only the Lord’s word to know that he is still with us and drawing us into an ever-changing reality grounded in his love and guidance. We only have the promise of the Holy Spirit at the Altar and in the world. And that promise is more than enough. 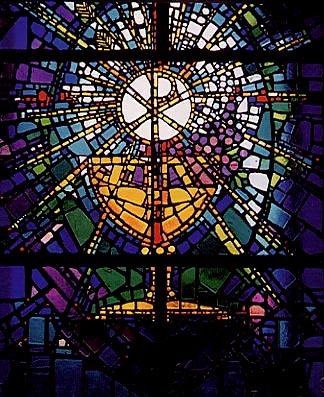 We talk much about a Baptismal Ecclesiology in the Episcopal Church but it might be helpful to also talk of Eucharistically-shaped communities. These are communities of vulnerability and boldness that find themselves and their hope revealed in the offering, blessing, breaking, and sharing of the Altar. As communities, we gather together in our hope, joy, confusion, and pain. We come to know the many gifts that God has given us. From our first breath to our eternal promise we are gifted in ways that defy explanation and undo human understanding of earning and effectiveness and we gather to give thanks. We are a people who hear the Word and promise of God together and pray without ceasing for one another and the world as we are welcomed to the throne of grace where we send up our intercessions and thanksgivings. We take all that we have and all that we are and offer it for God to take up and transform. We join our small gifts to that one great gift offered on the Altar and pray that we might find our offerings taken up for the spread of the Kingdom of God. We are a people whose own brokenness – whose fracture – is known and grieved over by God. We share not only in the perfect image of God but in the brokenness of the cross as we are those who shouted “Crucify” and those whom Christ forgave. We carry the cross and know that others around us find themselves, all too often, at the foot of the cross hiding from the terrors of this world. We are a people who share in the blessing of the Body. We are called to be blessed and set aside for God’s holy use and given new life and purpose as the Holy Spirit pours out upon all our gifts and the Body is healed and formed for the feeding of the whole creation. We are a people who are blessed for holy work. The blessing we receive, as a Body, is not so much a benediction alone as much as a charge to heal and offer hope and renewal. We are given the blessing to go and offer what we have received. There are committees and structures that will guide and govern our work as a people. But there is a more concrete reality unfolding all about us. People fed by Christ are doing Christ-like work all about us and the task ahead of us is not so much one of governance or management but one of finding ways of naming and lifting up that holy work. Our Church leaders are being called to a deeper conversation than one about structure. What does it mean to lead? We cannot simply try to pinpoint the strategic or sociological difficulties that confront us. We must ask ourselves basic, needful, and pressing questions that are not just for Episcopalians. What does it mean to be disciples of a Prince of Peace in a death-denying and yet violent culture? What does it mean to be disciples of a God of abundance and serve those who are financially or spiritually poor? What does it mean to serve a God of Truth in a culture of falsity and distraction? What does it mean to preach Kingdom in the face of Empire? What does it mean to be the whole Body in a culture that exploits and shames difference? What does it mean to follow Christ, to preach the Way, in a culture of temptation and indifference? These are Sacramental questions because they naturally lead us to look deeply at the world around us and not just see where God is acting but to inspire others with a vision of what a new and holy life looks like as transformation unfolds. We need to be the kinds of Christians that non-Christians have never met. The kind of Christians who see the world with the Love that God sees it and name God’s abundance and action in spite of the rampant insecurity and culture of scarcity that has us in its grips. We are being called to be the Church – to gather, to offer, to know brokenness, to find ourselves made whole, and to share the blessings of God all about us. We are called to be the Holy People of God within whom the Holy Spirit is welling up and who trust that the Lord is making common things holy indeed. Excellent questions. I hope we’ll all really think and talk about them in some depth as we go forward…. Thank you. Insightful and challenging.